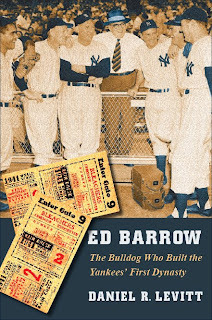 I just finished Ed Barrow: The Bulldog Who Built the Yankees' First Dynasty. It's by Dan Levitt, who previously co-authored Paths to Glory: How Great Baseball Teams Got That Way. It's a wonderful book which primarily seeks to answer two questions: (1) how did the sport’s competitive environment evolve in the first half of the 20th century; and (2) how did the Yankees come to dominate it. Some you in the tri-state area may be surprised to find out that such dominance was not simply bestowed by God Almighty. The book should be of interest to just about anyone who reads this site. Or anyone who enjoys baseball history. Or Yankees' fans. Or Yankees' haters. Or scholarly types who like to read about the business and finances of baseball. Or pleasure-readers who like to read stories of pugnacious 19th century renaissance men. What I'm saying is that there's a little bit for everyone here, and I recommended it highly. My full review of it should, editor willing, run in this Sunday's New York Post. It may even be good this time, as they have so graciously granted me 750 words instead of the usual 500 (you ever try to write 500 words on anything remotely complicated? Hardest thing in the world to do). Until then, here's Steve Treder's excellent review at The Hardball Times. An excerpt can be found here (click the link right below the picture of the cover). And here is a Q&A with Levitt which provides a nice overview of the project. Ed Barrow? Of the Boston Red Sox and New York Yankees? I knew it. There's been east coast bias all along. And now we can't blame it on ESPN. Will we never escape the madness?